There's no perfection between these men they both make mistakes such huge mistakes but it's never done with the intent to hurt the other person. Loren struggles to be the supportive partner that Elliot needs while still trying to pursue his career goals as a police officer. Elliot fights so hard to manage his condition and be what Lauren needs...they both stumble and have to find ways to pick themselves back up and put themselves and their relationship back together...it's heartbreaking, gut wrenching and seriously if you can read this book without shedding tears, without feeling their pain...well, you're a tougher person than I.
I had times when I was frustrated with Loren and Elliot but honestly never was there a point at which I didn't want them to find a way to be together. Melanie Hansen has created two incredibly amazing men in this story...not perfect but strong, resilient men who were willing to do what it took...anything it took to be together because when you love someone whose bipolar..."You're either all in or all out." All of this was made even more vivid for me with the addition of Michael Stellman's voice narrating this story. He gave such depth and emotion to these men and to the people in their lives allowing me to connect with the story on an emotional level that I'm not sure I would have felt had I just been reading the book. I'm not saying I wouldn't have still loved this book no I think it's more a case of Michael Stellman took a book that I would have loved regardless and simply made it that much better. 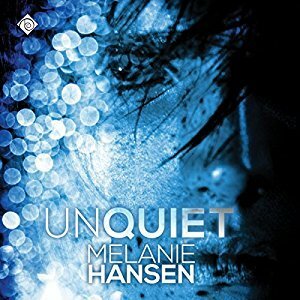 An audio book of "Unquiet" was graciously provided by the publisher in exchange for an honest review.